Preface. List of Contributors. Codes and number theories (I. Honkala, A. Tietäväinen). Coding theory at work in cryptology and vice versa (H.C.A. van Tilborg). Codes and designs (V.D. Tonchev). Ploynomial codes and finite geometries (E.F. Assmus Jr., J.D. Key). Codes and groups (W.C. Huffman). Codes and association schemes: Basic properties of association schemes relevant to coding (P. Camion). Decoding of cyclic codes and codes on curves (R.E. Blahur). Contrained systems and coding for recording channels (B.H. Marcus, R.M. Roth, P.H. Siegel). Sequences with low correlation (T. Helleseth, P. Vijay Kumar). Array codes (M. Blaum, P.G. Farrell, H.C.A. van Tilborg). Concatenated codes and their multilevel generalizations (I. Dumer). Trellis structure of codes (A. Vardy). Deep space applications (S. Wicker). Author index. Subject index. 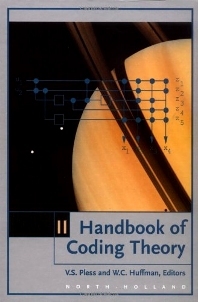 The second volume of this work contains Parts 2 and 3 of the "Handbook of Coding Theory". Part 2, "Connections", is devoted to connections between coding theory and other branches of mathematics and computer science. Part 3, "Applications", deals with a variety of applications for coding.